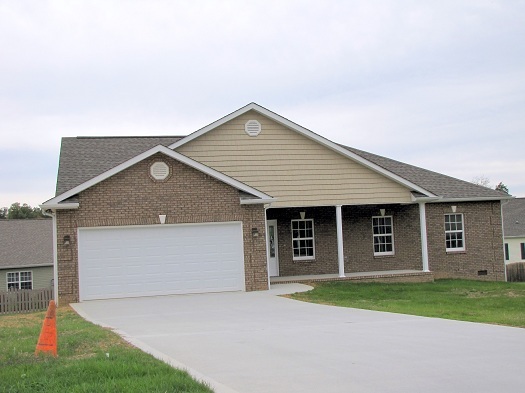 This spacious new home is designed to accommodate the needs of anyone who is looking for an affordable residence with plenty of room for entertaining. With a well-equipped open kitchen, luxurious master suite and soaring cathedral ceilings, this is a great place to host family and friends for regular gatherings...whether it's an intimate dinner party or a cookout on the large backyard deck with panoramic mountain views. With three generous sized bedrooms, there's ample room for a growing family or active retirees who expect regular visits from the grandkids. And the large spa-like master bath completes complete with shower and tub, along with plenty of closet space. A large washer-dryer area, conveniently situated near the entry to the attached two-car garage makes laundry chores a snap. Located in the quiet, secluded neighborhood of Brookstone Ridge, yet readily accessible to nearby shops, restaurants and excellent medical facilities, this is truly a home for anyone desiring to escape the hectic life and traffic of urban living. And one can not overlook the appeal of the surrounding mountains and lakes, especially in view of the fact that an abundance of outdoor recreational opportunities are just minutes away. Within less than 15 minutes of your front door, you'll discover three state parks, filled with miles of hiking trails, acres of lakefront shoreline and more great fishing spots than you can explore in a lifetime. Visitors come from throughout the eastern United States to enjoy the water paradise of Norris Lake, with its 34,000 acres. And the Clinch River boasts some of the best trout fishing to be found anyone.